I got a sweet surprise today. A love letter from my one and only sister. – My dad is my adviser. – Mommy keeps me grounded. – My big brother is my great example. – And the most important of it all, my sister makes me feel loved. Forget Facebook, Twitter, or even email. There is nothing sweeter and more thoughtful than receiving a letter, the old fashion way. 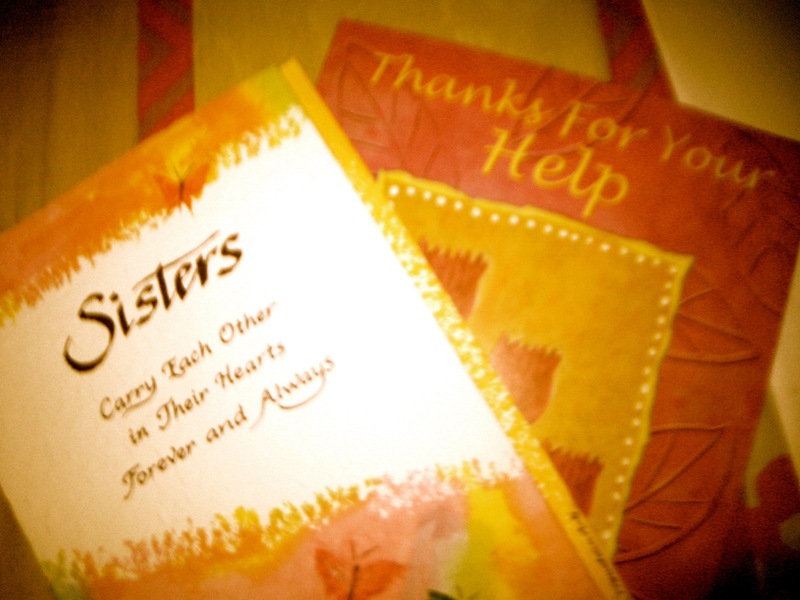 Reading my sister’s card relieved me of the stress from a long and lousy day at work. It made me cry, and yes, a bit homesick, but it somehow removed me from my state of being perfectly lonely. Whether they live near each other or far apart, sisters walk through life together. They’re there for each other no matter what… sharing everything. Sisters are connected at the heart and in their blood, and their loyalty to one another is permanent. No one can ever break that bond. They don’t give up on each other easily. They have the utmost sensitivity and compassion for one another because they were born into the same family. Sisters aren’t afraid to break rules for each other. They defend each other; they take chances for each other. They’ve cried together and laughed together. They know each other’s secrets. They forgive each other when they make mistakes, and they can almost read each other’s mind. Sisters teach each other lessons as they stand by each other in life, and they are there for each other through everything that matters. You can always run to me when you need help. You can always depend on me, on your family, but remember, I (we) won’t always be here. So you also need to learn how to be independent. I won’t promise you unconditional love, humans aren’t capable of that. Instead, I will promise to understand you but I won’t tolerate your irrational ways. Make wise decisions and never compromise. Pray for it. Pray for everything. Don’t let the glitters and glamour of the world pull you away from God’s will. You are a strong and beautiful lady, I hope you know that. I envy you because at that age of yours you went to a lot of places, did a lot of things, made gazillion friends and retained them, and the most important, you’re where God wants you to be. Don’t compare yourself to me. Your achievements are far more greater than mine, with more substance, more value, in this world now and in the next life. Continue to be yourself, if not better.